For about the last 20 years I've bought my shoes from 'Vegetarian Shoes' in Brighton, a small city on the south coast of England. It was developed by the Victorians as a seaside escape from London, and now has about 8 million visitors per year. But even before the Victorians arrived, Brighton had a quirky history - the Indian-style Pavilion, below, was built by the Prince Regent over 200 years ago. Hazel and I went back down for a few days a while back. 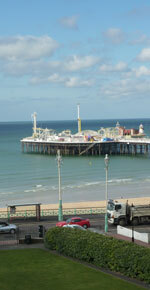 The photo on the right was the view from our window looking across the end of the pier. As we live in the countryside, and a long way inland, when we want to get away we usually head for a town, preferably by the sea. Our hotel is not totally veg*n, none of them are, but they nearly all offer a full vegan breakfast and this one was excellent. 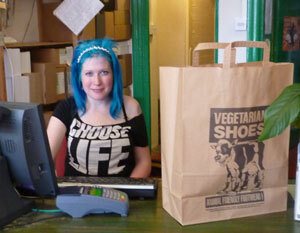 Above is a slice of Gardener Street, Vegetarian Shoes on the left - and here's Laura selling me some new shoes. Then after a hard morning shopping, over the road to Infinity Foods, veggie organic wholefood, where we sat in the upstairs window watching the world go by over lunch. A couple of years ago Brighton elected the first ever British Green Party MP (Member of Parliament) - Caroline Lucas who has represented Brighton at the European Parliament since 1999. They have lots of Green politicians in Europe but the antiquated UK electoral system is designed to keep the establishment in power, and they have clung on to it. Caroline got elected because of the significant 'alternative community' living there. As one national newspaper reported: "After the eight-hour count to victory, the exhausted new MP sat with supporters to toast their victory with fair-trade champagne and a vegetarian fry-up." “... We were here to eat at Terre à Terre, which has picked up a hand-made reputation for good food cooked by Amanda Powley with Philip Taylor. ... Nothing on the menu is anything you've eaten elsewhere. ... I was so intrigued by this food that I bought the cookbook,... And it's vegetarian! "... THE COWLEY CLUB is a venue but more important an all-round cultural centre, it's run by an anarchist co-operative and has all kinds of shows, club nights, protest meetings and more. it sells books and has lots of free courses, for example english courses for asylum seekers or meetings about breaking up BNP rallies or electoral plans. it's also a super-cheap vegan cafe in the daytime. It rules basically, and pretty much summarizes what i like about Brighton. ...blood red shoes is not even remotely vegetarian, which actually makes us the minority in a town like Brighton. "... HAND IN HAND is up around an area called Kemptown - which is generally worth checking out anyway as it's pretty cool - this place is tiny and brews its own ales in the basement. It also sells cheap pies which are freshly made by a local muso, the thai vegetable ones are ace. "...get on the BIG LEMON eco-friendly vegetable-oil fuelled bus and get into town [photo right: the bus ready for a wedding]. ... a town with a rich history of insane, hippy, lefty, drug maniac, eco-warrior, nocturnal, organic vege, oh-so-bohemian ridiculousness." 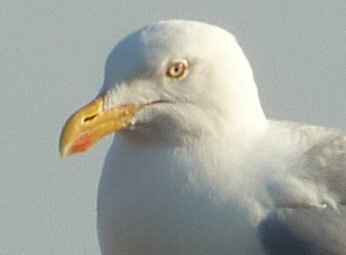 Naturally I have to do some wildlife photography - the one one on the right is a Herring Gull, it was sitting on a post above an open-air pub on the beach. They are very big, very bold, and dive down for any food which is not guarded closely enough, not bothering to wait for left-overs.